The IJABIM vision is to publishing scholarly empirical and theoretical research articles, which offer its authors and readers a combination of academic rigor and professional development. We cannot achieve our mission without the contribution of IJABIM reviewers who insights, comments and evaluations assist authors to produce articles of the highest quality. We are continue to develop a community that composed of professionals and experts with backgrounds in a variety of subject areas concentrating on business, management and economics and from different parts of countries. By participating as the reviewers in IJABIM, we hope to offer this opportunity for you to be listed down in this community. International Journal of Applied Business and International Management (IJABIM) is an academic, interdisciplinary, and peer-reviewed publication (Print ISSN: 2614-7432) and (Online ISSN: 2621-2862) on International Business and Professional Management published from Indonesia. 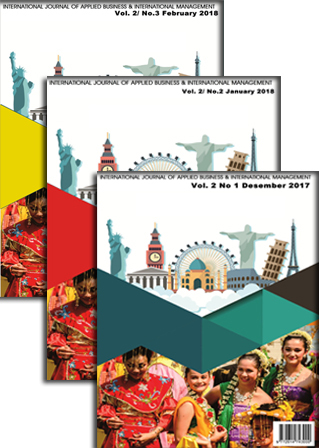 The aims of the IJABIM to feature narrative, theoretical and empirically-based research articles, student/faculty reflections, study abroad experience, and book reviews relevant to international students and their cross-cultural experiences and understanding in international business. IJABIM is indexed by Google Scholar, Neliti and PKP Index.